At the end of last month the Times of Israel reported that Hamas has some new office space. “Hamas recently opened up official offices in the Tunisian capital, Tunis, a senior leader from the terror group revealed on Sunday. Moussa Abu Marzouk told the Tunisian news channel el-Bilad that Hamas has “new-old” offices in Tunis, publicly acknowledging the headquarters for the first time. BBC audience members who recall the 2013 article by BBC Arabic’s Ahmed Maher in which they were told that everything is rosy for Tunisian Jews post ‘Arab Spring’ might perhaps be astonished to hear that the Tunisian authorities have apparently agreed to host an antisemitic terrorist organisation. Those who remember Magdi Abdelhadi’s report from Tunisia just months beforehand would probably be less surprised. The BBC has however relieved audiences of that potential dissonance by simply ignoring the story of the Islamist terror group’s new offices in the country it has described as having had “the most successful” ‘Arab Spring’ uprising, as “keeping Arab Spring ideals alive” and as having a government “with progressive ambitions“. The Tweet below was sent on the morning of August 3rd by one of the BBC correspondents currently located in the Gaza Strip. Pannell promotes two inaccurate pieces of information here, the first being that “militants denied it from the start”. 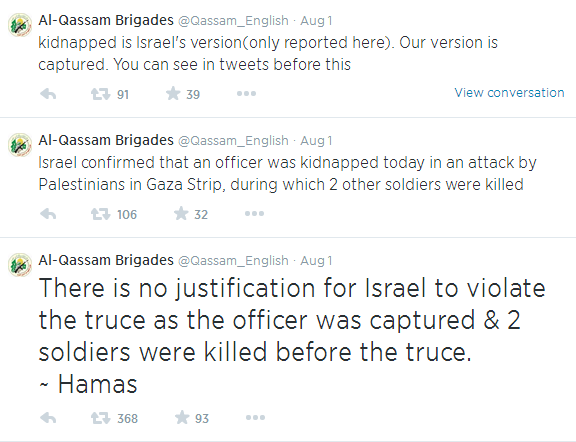 In fact, Hamas’ Al Qassam Brigades originally claimed to have abducted an Israeli soldier and killed two others – albeit with the addition of deliberately false information concerning the time of the attack – as can be seen on their Twitter timeline. Initially, Hamas official Mousa Abu Marzouk also stated that Hamas had abducted an Israeli soldier, with similarly inaccurate claims regarding the timing of the attack. Only later on in the day did Hamas spokesmen backtrack and deny involvement, meaning that Pannell’s claim that “militants denied it from the start” is both inaccurate and misleading. 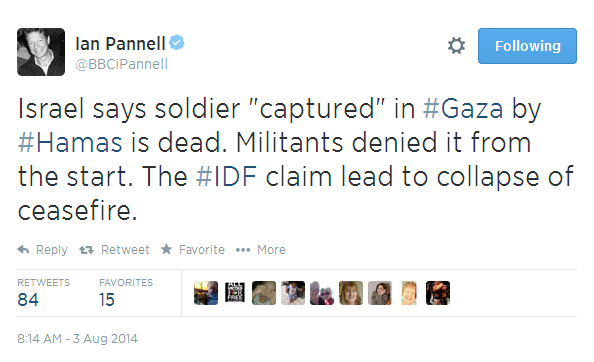 Pannell’s second claim is that “The IDF claim lead [sic] to collapse of ceasefire”. In other words, Pannell would have his 15.1 thousand Twitter followers believe that the 72 hour humanitarian ceasefire did not collapse because of the fact that 90 minutes after its commencement, terrorists attacked soldiers from the Givati Brigade engaged in decommissioning a cross-border Hamas attack tunnel as permitted under the terms of that ceasefire according to the US Secretary of State. Instead, Ian Pannell would like you to believe that the ceasefire collapsed because the IDF announced that it had a soldier unaccounted for and suspected kidnapped after that attack and that Hamas’ actions are not part of the story at all. 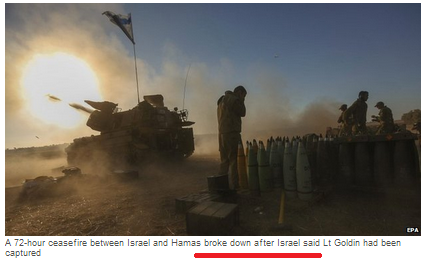 But can Pannell’s all too obviously politically motivated attempts to rewrite the events of the morning of August 1st – and to edge his Twitter followers towards the view that Israel, not Hamas, is responsible for the ceasefire’s collapse – be seen as a clear breach of BBC editorial guidelines by a lone BBC reporter? The answer to that question appears to be no. 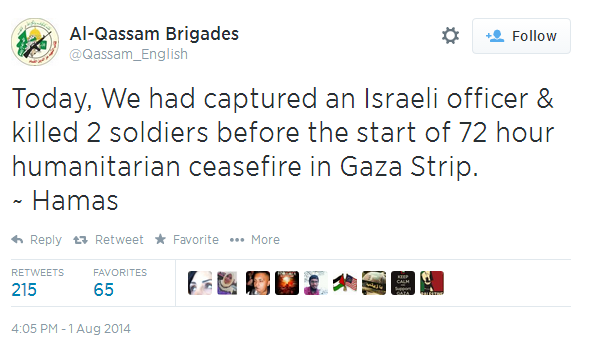 In fact, of course, the ceasefire broke down after Hamas terrorists attacked Israeli soldiers at 09:30 on August 1st. Half an hour after that, terrorists also fired missiles at the Kerem Shalom area in Southern Israel. Again, this inaccurate portrayal conceals from audience view the fact that the ceasefire collapsed because Hamas terrorists breached it by carrying out a preplanned attack on Israeli soldiers which included a suicide bombing and shooting: not because an officer was stated to be unaccounted for at the end of the ensuing fighting in which two other soldiers were also killed. “The raid, which included a suicide bombing and involved enemy gunmen emerging from a tunnel shaft, came at 9:30 in the morning, during the early hours of what was to have been a 72-hour truce, and may signal a significant escalation in the 25-day-old war with Gaza. As was documented here yesterday (see here and here), the BBC’s portrayal of the reason for the breakdown of the 72 hour humanitarian truce on August 1st has for the most part been lacking in accuracy, impartiality and even basic coherence. Rather than rectifying that dismal state of affairs, the BBC seems determined to continue and even widen its campaign of deliberate distortion. Let us not forget that at some point, these distortions will become part of the BBC’s online “historical records“, even though the corporation clearly cannot even report three day-old history accurately.